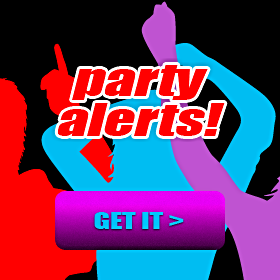 Attend The Crowd Party w/ STORY , 10:00 PM - 05:00 AM on Fri, Mar 21 2014 @ Radio Bar , Miami Beach, FL, USA MIAMI BEACH PARTY CROWD'S ALL NIGHT DANCE PARTY 1 TICKET. 3 PARTIES. 10 PM - 5 AM. ANOTHER NIGHT ON SOUTH BEACH! This South Beach Party lineup... Pre-Party @ radio bar Dance Party @ story After-Party @ TED'S HIDEAWAY PARTY LIKE A ROCKSTAR, ON A FIXED BUDGET! Party in style, stretch limo rides between party venues. NO WAITING IN LINE, ANYWHERE. SEMI-OPEN BAR @ Pre-Party Table/Bottle Service @ Dance Party SEMI-OPEN BAR @ After Party Learn more about Crowd Parties > This South Beach Party experience... The Pre Party, from 10 PM - 12 AM, is where it all starts! You meet, mix and mingle with the Crowd. Drink and even dine, you know, for all the drinking and dancing ahead in the night! We designed our Pre Party to allow you to socialize and easily find friends with whom you have real chemistry. AND WE BREAK THE ICE. With a mix of innovative social games, and personal one-on-one introductions by our friendly hosts and hostesses, you will never have more fun meeting and making new friends. The Pre Party plugs you into the Crowd, and gets you REALLY ready to party like a ROCKSTAR. The Dance Party, from 12 AM - 3 AM is the main event. The Crowd heads to one of the Beach's premier dance nightclubs for the time of your life. Huge sounds, huge dance floors, huge crowd. NO mood-killing waiting lines, we deliver VIP entry to the hottest dance clubs on the Beach. Within the Crowd, you are a celebrity, and will party HARD with YOUR CROWD. The After Party, from 3 AM - 5 AM, is the perfect ending to your night out on the Beach. Hosted in a cozy, intimate lounge, you have a chance to sit down, catch your breath and cement new friendships made in the Crowd. It's a quiet place to share a nightcap, exchange digits, and of course, create your happy ending.... PRE-PARTY @ DANCE PARTY @ AFTER PARTY @ JOIN THE CROWD. GET YOUR PARTY PASS NOW! 1 TICKET. 3 PARTIES. 10 PM - 5 AM. ANOTHER NIGHT ON SOUTH BEACH! PARTY LIKE A ROCKSTAR, ON A FIXED BUDGET! Party in style, stretch limo rides between party venues. NO WAITING IN LINE, ANYWHERE. The Pre Party, from 10 PM - 12 AM, is where it all starts! You meet, mix and mingle with the Crowd. Drink and even dine, you know, for all the drinking and dancing ahead in the night! We designed our Pre Party to allow you to socialize and easily find friends with whom you have real chemistry. AND WE BREAK THE ICE. With a mix of innovative social games, and personal one-on-one introductions by our friendly hosts and hostesses, you will never have more fun meeting and making new friends. The Pre Party plugs you into the Crowd, and gets you REALLY ready to party like a ROCKSTAR. The Dance Party, from 12 AM - 3 AM is the main event. The Crowd heads to one of the Beach's premier dance nightclubs for the time of your life. Huge sounds, huge dance floors, huge crowd. NO mood-killing waiting lines, we deliver VIP entry to the hottest dance clubs on the Beach. Within the Crowd, you are a celebrity, and will party HARD with YOUR CROWD. Radio Bar is the newest addition to the rapid bar trend in Miami. Using the back door as an entrance (where the radio tower is stationed), Radio’s ambiance is refreshingly unique, offering a friendly spot to enjoy a craft cocktail while dancing to eclectic tunes. The new beverage program compliments the inviting atmosphere whereas one would feel just as comfortable in flip flops or a business suit when sipping on a great rum or bourbon. Radio is a not only just serving Miami Beach locals craft beers and handcrafted cocktails but a new “snack bar” featuring hot dogs, grilled cheese sandwiches and popcorn. The main entrance is situated on 1st Street, but the back entryway East of the bar is recommended as a courtesy to residents for guests arriving after 11PM. Created by MMG, the company behind Miami's LIV Nightclub, STORY is a unique destination for consumers looking for an unparalleled, high energy nightlife experience. The 27,000 square foot space is equipped with a state-of-the art Infinite Hybrid Sound System and its concert style lighting and visuals stand bigger and bolder than the competition. Its stylish design and sophisticated feel compliment a premium bottle service experience, offering over 60 exclusive VIP tables & five full-service bars. Story’s in-house production & design team transforms the venue on a nightly basis into an extravagant circus-style setting where nothing’s shocking. One of South Beach's local favorites, Ted's Hideaway is gem! Come join us at this premier establishment for a night to remember. JOIN THE CROWD. GET YOUR PARTY PASS NOW! Connect with friends and make new friends! Networking made easy and fun! Meet people easily at this event by playing the Connect Game. Go to the event with your 3 numbers. That's it! You are guaranteed to have the best time! Event Raffles - Enter FREE, win BIG!! 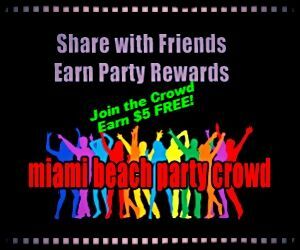 party crowd's Facebook Fan Appreciation Promotion! Win an iPad Mini + Retina Display! Sorry, this raffle is already over. Released: Friday, March 14, 2014! Plug into the Crowd! Email alerts on upcoming events, offers, promotions, discounts and more! Looking for an amazing nightlife experience on South Beach, Miami? Look no further, join the Party Crowd today & party in the company of friends! 1 Ticket. 3 Parties. 10 PM - 5AM. EVERY DAY! A Pre-Party. A Dance Party. An After Party. ALL NIGHT PARTY. The best nightclubs, danceclubs, bars, lounges & personal concierge service! Stretch limo rides between party venues. And, drinks included! Party like a ROCKSTAR in South Beach Miami, on a FIXED budget! © Copyright. Miami Beach Party Crowd.